With the marketing tools available in mSPA® you will be able to make informed decisions about where and how to advertise by tracking referral sources. You will know what products and services to sell or discontinue by monitoring trends over various time frames. Just as you monitor the booking rate of staff after consultations, you can also see a report of those clients who had consultations but did not book services, allowing you to call or e-mail them in order to set up an appointment. Keeping in contact with your clients is important. With the Client Listing you can view a list or export your new clients, contact clients that haven't been in for over 6 months, contact your clients that have had certain services or purchased certain products. This makes it simple to send a mass e-mail or call clients to re-establish contact and book appointments. Using our Projection Report you can view services with very few appointments or the next few weeks or months. This allows you to run promotions, specials or increase mailings to advertise the benefits of these particular services, hopefully increasing your appointments in these areas. 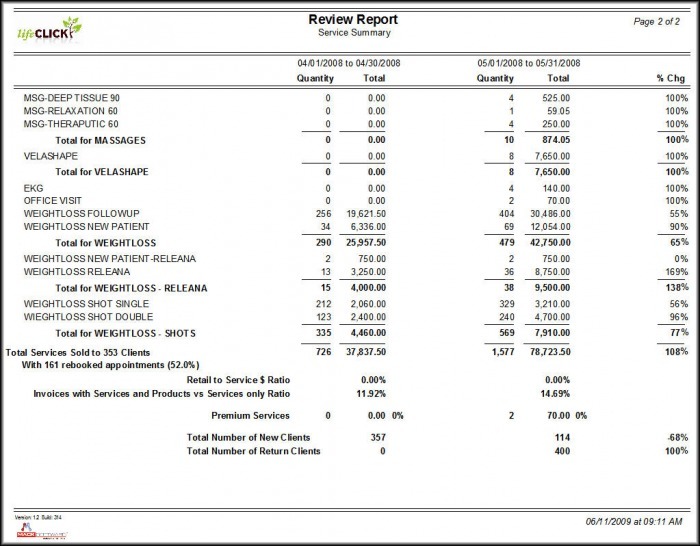 Because clients have the ability to purchase a series of services, for example a series of laser hair removal, you will want to monitor our Series Outstanding Report so that you will always know the status of your current series liability. You can monitor by service (botox or laser hair) or by client. mSPA® also includes a one-click QuickBooks® integration option.